Inbox full of invites? This drapey dress is just made for summer events. 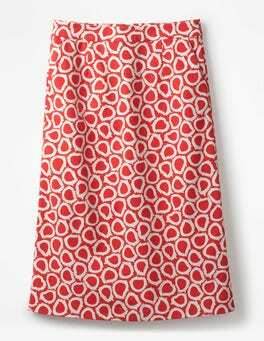 The asymmetric flippy skirt is offset by flattering touches like waist detailing and a chic boat neck. The satin crepe gives it an elegant flow which is fit for every special occasion. Little sun seekers will feel as breezy as the seaside air in this lightweight, flutter-sleeved dress. The skirt is super swishy thanks to layers of ruffles, while bright embroidery brings the summer fun. Anyone for ice cream? …they shorts? Are they a skirt? Look again: they're super-flippy culottes. Wide and relaxed with an elasticated waist to create soft gathers, they're about as breezy as can be. Along with a bright floral print, they have a playful pom-braid trim and a plaited drawcord with tassels. Summer must-haves.